CNC (Computerized Numerical Control) Machining is where a computer controls the movement of the machine axes. As a result, manufactures could bring their product to market much faster. Prior to the invention of CNC, a human operator, using complex math, would manually machine parts using a knee mill or other hand tools. Furthermore, the process was exhausting and lead to high cost and delivery due to the time it would take to do the math and manually move axes by hand. Because of the speed, manufacturing companies use CNC machining to produce simple to complex parts, involving 2-5 axes. Materials used in this process vary greatly, however most parts produced are from plastic or metal. The CNC process begins with a 3d CAD model of the part. The CAD model is then processed through a CAM (computer aided machining) program where cutter paths are generated. The cutter path is the rout the cutting tool will take to remove the material. Although the CAM software generates the tool-path, a computer programmer will determine the best strategy for removing the material. The cutting tool is controlled along multiple linear or rotational axes of the machine. The more axes a machine controls, the more complex of a part that can be made. Furthermore, a 3 axis CNC machine cuts linearly along the X axis (width), the Y Axis (length) and Z axis (depth). Also, with the addition of rotation to the Z axis (C axis), and to the X axis (B axis) alike, the result is a machine with 5 axis capabilities. An example of a 5 axis part would be a boat propeller, as the C and B axis would need to rotate to follow the contour of the blades as they bend underneath the z axis. number of sides that need machining, a cube with a hole in each side would require 6 sides to be machining. 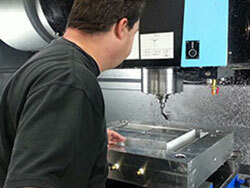 For more information on our machining capabilities, Check out our CNC services Here.